A processor with two layer cache writes a byte to zero, none of the memory is in cache. in layer 2 cache, do not find it, instruct the layer 2 cache to fetch the memory. 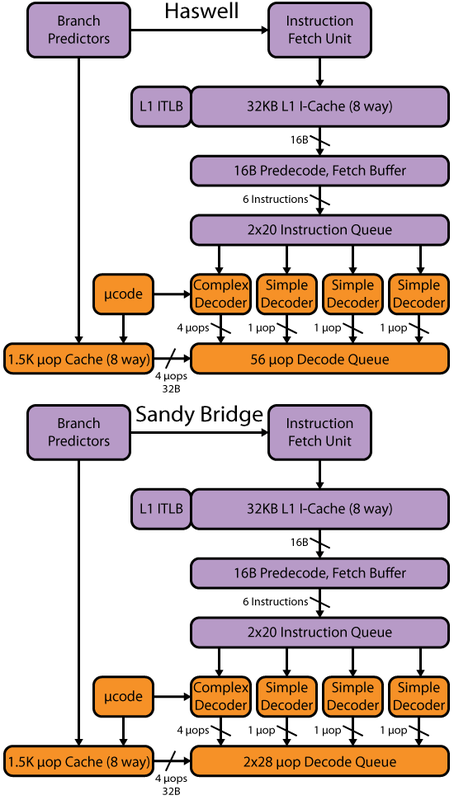 When the layer 1 cache line is filled, the instruction to clear the byte executes. back to memory: a layer 1 cache line or a layer 2 cache line (which would be a lot bigger). In other words, is there "dirty bits" for every layer 1 cache line inside the layer 2 cache? Thanks. Pointers to documentation welcomed. Etienne (etienne_lorrain.delete@this.yahoo.fr) on July 5, 2013 3:14 am wrote: > Sorry to switch subject, I have a question I do not know where to ask: > (please note I am not a hardware specialist) > > A processor with two layer cache writes a byte to zero, none of the memory is in cache. > So the processor system looks for the address in layer 1 cache, do not find it, looks > in layer 2 cache, do not find it, instruct the layer 2 cache to fetch the memory. > When the layer 1 cache line is filled, the instruction to clear the byte executes. > If at that point both layer cache are no more needed and evicted, what size is written > back to memory: a layer 1 cache line or a layer 2 cache line (which would be a lot bigger). > In other words, is there "dirty bits" for every layer 1 cache line inside the layer 2 cache? > > Thanks. Pointers to documentation welcomed.